There is only one word to tell how our stay was, Fantastic. Everything was top. Everything was excellent. 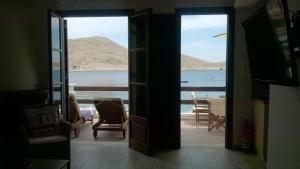 The faclities were great and the apartment was beautiful with the sea lapping in the harbour just outside the entrance. Brilliant! Don’t tell everybody though. Everything was perfect. This is our second stay at Halkis Muses. Dimitris and his team are kind and cannot do enough for you. We will most certainly be returning. 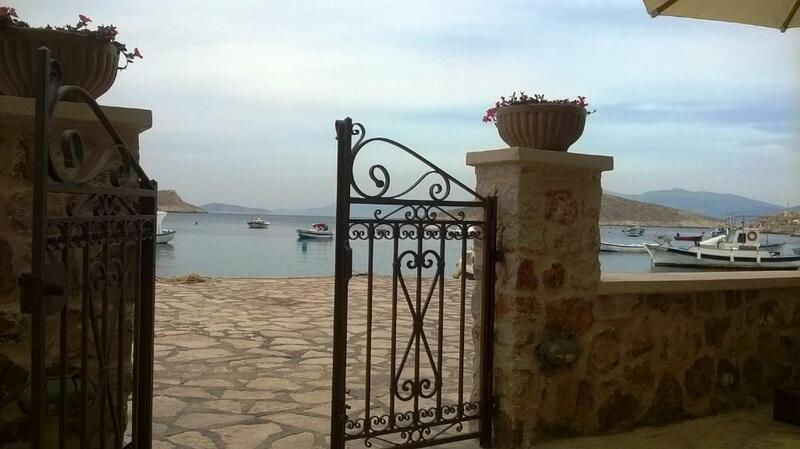 Halki is a beautiful place so very calming and relaxing and our stay here made it even more enjoyable. Perfect hosts with professional hospitality and personal, kind attention to us, clean, tidy and cosy apartment with a fantastic location overlooking this beautiful village port having the sea at our feets. Couldn't have imagined better. Magnificent view, lovely decor, cleanliness, many books to read, complimentary drinks and most of all the wonderful hosts who were so helpful and giving of their knowledge and time and made our stay in Chalki an excellent experience. This is an excellent place to stay. Beautiful interior and facilities were more than expected, even had a washing machine. We sat out at the table each morning for breakfast watching the sunrise and on the sun loungers in the afternoon after coming back from the beach. In the evening you just decided which restaurant to eat at, which are all within a few footsteps from apartment. We were met and welcomed by Popy who is a lovely girl and was available during our stay if we needed any help. Halkis Muses was a really special place to stay. Our host Dimitris had thought of everything - we were even provided with toothbrushes and toothpaste! Poppy who was looking after us was extremely helpful and nothing seemed to be too much trouble. The house itself is very newly renovated and done with the utmost taste. 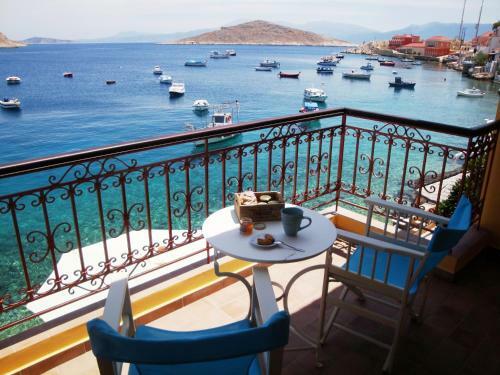 It is cool and airy with a lovely view of the harbour and only a very short stroll to the local tavernas and beaches - if you can drag yourself away from the terrace! Lock in a great price for Halkis Muses – rated 9.9 by recent guests! 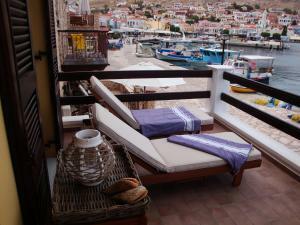 Featuring air conditioning, Halkis Muses offers accommodations in Halki. Free WiFi is featured throughout the property. All units have a flat-screen TV with satellite channels. Some units feature a seating area and/or terrace. All units include a kitchen equipped with an oven and toaster. A fridge is also available, as well as a coffee machine and a kettle. Bed linen is offered. When would you like to stay at Halkis Muses? This holiday home has a balcony, toaster and stovetop. This apartment features a fireplace, stovetop and tile/marble floor. This apartment has a balcony, sofa and kitchenware. Halkis Muses are named by the three original muses, according to Pausanias, Mneme, Aede and Melete. They were daughters of Uranus and Gaias and together, the three muses, form the complete picture of the preconditions of poetic art. Mneme means memory and because the memories that all the family has from the stone villa it was the perfect choise for naming the house. Aede means song or voice and the house closer to the sea got the name because it is the perfect place to hear the song or the voice of the sea. Aede's name is a melodic name because it is formed by the notes A-E-D-E. Melete means practice and the house with the balcony and the amazing view provides a unique place for reading and relaxing. Traveling, fishing and sailing are our familys favourite hobbies. 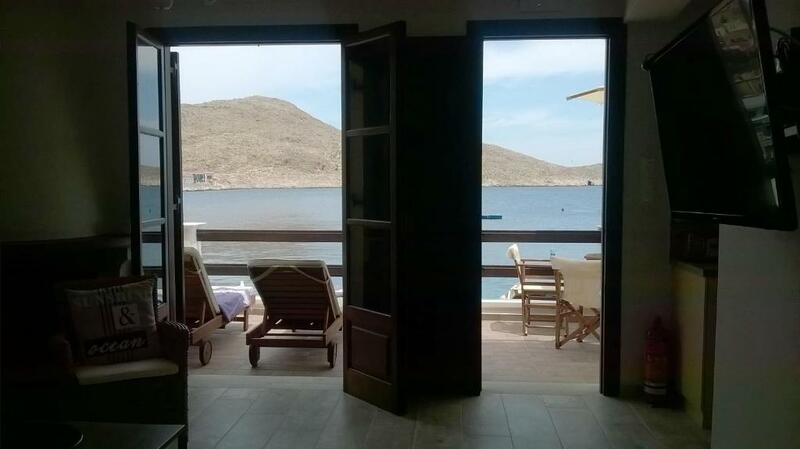 The view, the oportunity to fish and swim infront of the house along with the small distance from the port and the center of the island makes the place so extraordinary. House Rules Halkis Muses takes special requests – add in the next step! Halkis Muses accepts these cards and reserves the right to temporarily hold an amount prior to arrival. Please inform Halkis Muses of your expected arrival time in advance. You can use the Special Requests box when booking, or contact the property directly using the contact details in your confirmation. Nothing .. it was all excellent. Can't list here anything at all. The door lock was quite difficult to open with the key. Nothing - I really can't think of any negatives at all. There is nothing people can't like. the view from the balcony & the people. There was not a single thing that we asked and They didn't help! Excellent, genuine and professional Service!! location of the property, the property its self & hosts. Location was perfect, beautiful and idyllic. 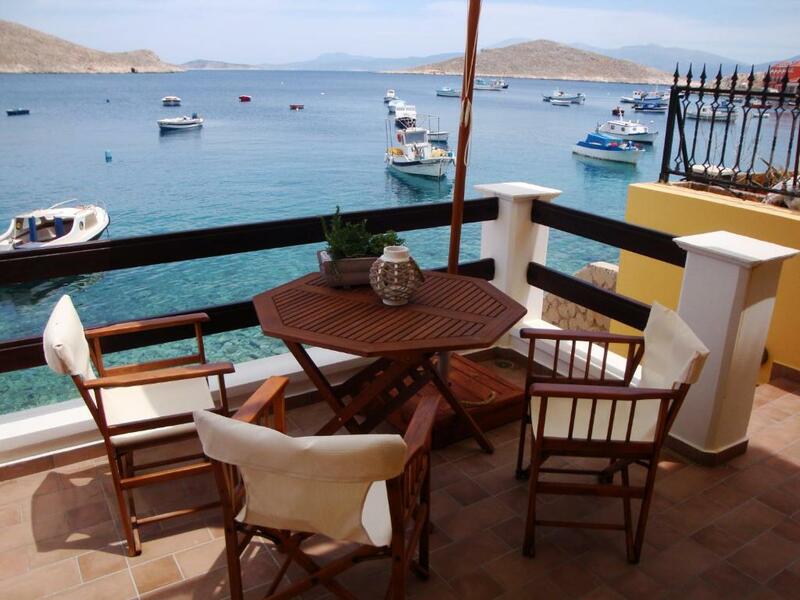 Stunning views in a very calm location with easy access to the local tavernas, bars and the few supermarkets that stock everything you need.The property has been well thought out, Dimitris has provided everything you need and more. From the moment we stepped off the boat (there are various boats you can catch from Rhodes to get to Halki, check Facebook..Nissos Halki, Fedon & Nikos Express). Poppy was there to greet us, with a warm welcome she walked us to the apartment, which was minutes away, explained everything about the apartment, it's story, that sets the tone for your peaceful relaxing stay. The facilities were excellent all the practical things you need , everything from a washing machine to three different coffee machine options! A generous welcome pack including various drink options, coffee, fruit juices, melba toasts, jams, breakfast bars. Lovely natural toiletries from their little shop on the harbour ..and even toothbrushes and toothpaste! We were overwhelmed and immediately felt spoilt and cared for. The apartment was spotless, the lovely friendly lady came every day to give it a once over change bedding etc.The facilities..again every detail considered, iron, ironing board, TV, use of a laptop, good wifi and even a mobile for you to use on the island to get hold of Poppy or Dimitris if you should need to. Brand new kitchen, fully equipped if you should decide to stay home and eat on the balcony..which again was well thought out, large table and chairs, parasol, sun loungers, with just a few steps directly into the crystal clear sea...where we sat and watched small octopus, cuttlefish etc (you might want to bring sea shoes with you). 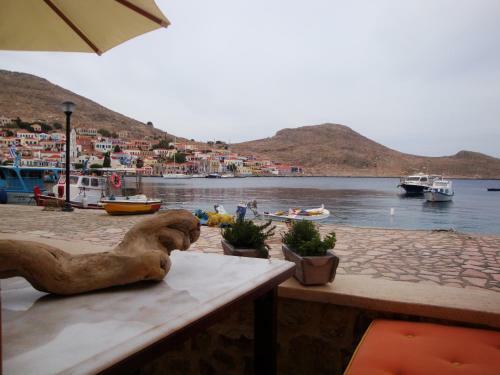 We booked for three nights, as we have never been to Halki before and we wondered if we would feel that there wasn't enough to do on such a small island... HOW WRONG WE WERE! Halki itself is beautiful!